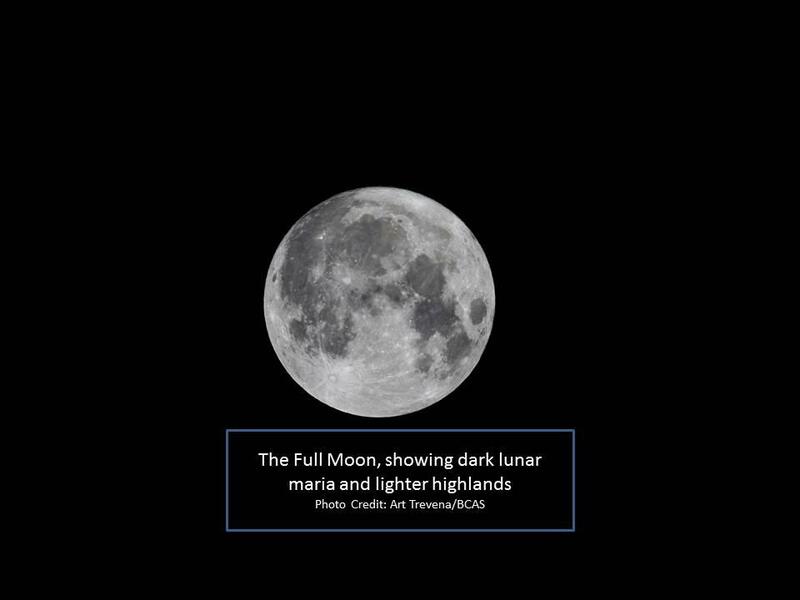 Humans have been looking at the Moon and contemplating its “face,” and various light and dark features for millennia. We only see the near side of the Moon from Earth. This is due to what is called tidal locking. The Moon rotates exactly once each trip around the Earth, causing what we call the “near side” to always face the Earth. The “face” that we see contains numerous dark lunar maria, which is Latin for “seas.” Some very early astronomers mistook maria for actual seas or large bodies of water, hence the name. Most maria are huge impact basins hundreds of miles wide that were later filled by repeated flows of basaltic lava. The maria are dark and poorly reflective due to the iron-rich composition of their lava. In contrast, the highland areas of the lunar surface are lighter in color because they contain less iron and more aluminum. The maria comprise approximately 16 percent of the lunar surface, mostly on the side we see. The ages of the maria have been determined by radiometric dating and by crater counting. The majority of the mare basalt eruptions are estimated to be between 3 to 3.84 billion years old. The contrasting patterns formed by the lunar maria have aroused the imaginations of people throughout history. Different cultures have conjured up images of animals, faces, or objects represented on the disc of the Moon. The Man in the Moon, the Chinese Moon rabbit, and Saint George killing the dragon, are examples of these lunar pareidolic, or perceived images. Just as we sometimes “see” objects when looking at cloud formations, images also appear to us when looking at the Moon. Go out on some clear night when the Moon is full and try to “see” what others before you have picked out in the contrasting dark maria “seas” and light lunar highlands. Do the maria form the face of an old man, or can you pick out the ears of a rabbit? What do you see? Oh, and by the way, the Moon isn’t made of green cheese; the Apollo astronauts on the Moon proved that. Western Slope Skies is written and produced by members of the Black Canyon Astronomical Society. This episode was written and recorded by Joyce Tanihara.